On 30 April GFS held its second annual Science Advisory Group meeting in London. This one-day workshop brought together a variety of system-thinking experts from across the food system to discuss the current events and recent scientific advancements that are likely to impact the global and UK food security landscapes in the future. The group then agreed on 10 priority research questions for the food system, which GFS programme activities will aim to address. These priority research questions will be published in our next Horizon Scanning Report. Find out more about the governance of the GFS programme. The GFS Science Advisory Group comprises a number of prominent researchers with interests spanning the food system. The aim of this group is to provide expert advice and guidance to the GFS programme, ensuring our work is at the cutting edge of scientific research. In 2010 the Global Food Security (GFS) programme conducted a Priority Questions (ref 1) exercise to identify key research challenges central to improving the UK food system’s efficiency and effectiveness in a global context. 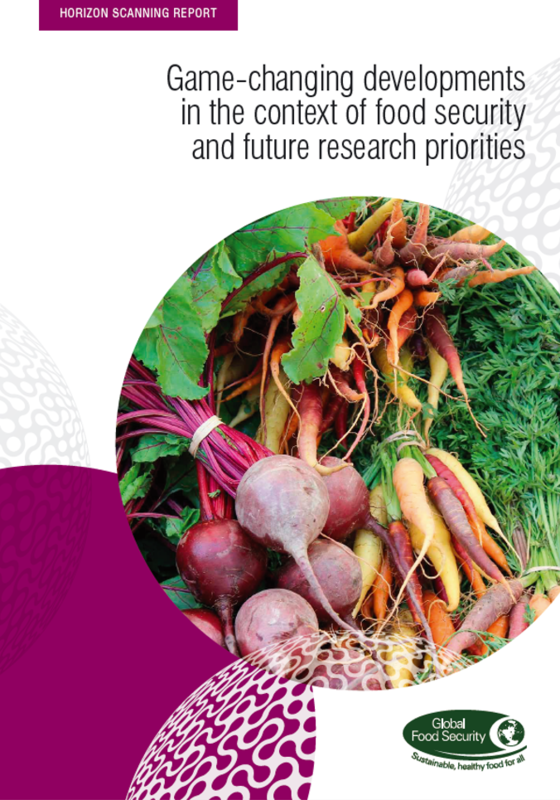 Outputs from this work not only fed into future priorities for the GFS programme, but also provided the backbone for GFS’ flagship funding programme, Resilience of the UK food system in a global context (ref 2). Alongside the release of the new GFS strategy (ref 3) in 2017, the GFS Science Advisory Group workshop will provide an opportunity for this interdisciplinary group to share expertise from across the food system and conduct a priority questions exercise based on the latest contextual developments and research advances. It is envisaged this work will be repeated on an annual basis, reflecting changes in the external environment – for example, political change, or new funding mechanisms – as well as advances in research. This will inform the future work of the GFS programme, providing a cutting-edge view of the food system and the priority challenges to be addressed. Priority research questions for the UK food system (GFS, 2013). GFS Strategic Plan (GFS, 2017).